James Richards, Raking Light, 2014, single channel video, 5 minutes 31 seconds. 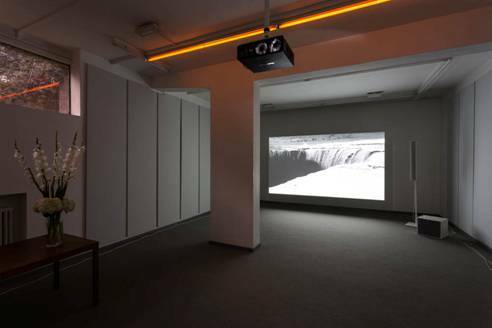 Installation view, Raking Light, Cabinet, London, October 11 – December 6, 2014. Photograph by Mark Blower. Courtesy the artist and Cabinet, London. © the artist. One of the distinguishing features of the offerings of Frieze week this year has been the relative absence of the moving image work that had dominated in previous years. Performance and the immersive experience have been the themes to be discerned in the overwhelming, super-abundance of art that has settled over London this October. So it comes as a refreshing change to step out of the thundering traffic noise of Old Street and see the brand new work by James Richards at Cabinet Gallery. 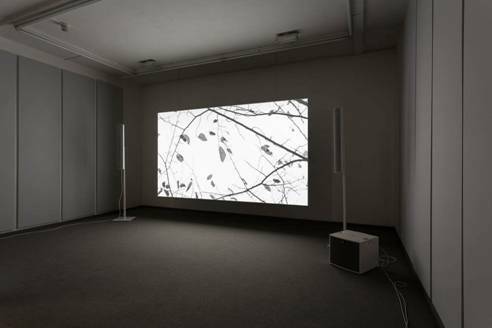 Richards is nominated for the Turner Prize this year, and is showing his 2013 work Rosebud at Tate at the moment. I am going to stick my neck out and say that I like this most recent work better. Raking Light, 2014 is as close as I have seen to a visual poem. It has rhyme, rhythm, a wealth of allusion and a highly distinctive and seductive aesthetic ‘voice’. It is elemental in that it appears to deliberately organise itself around visions of earth, air, fire and water. It evokes landscape, sometimes in a darkly gothic register, at others in a lighter, romantic vein. 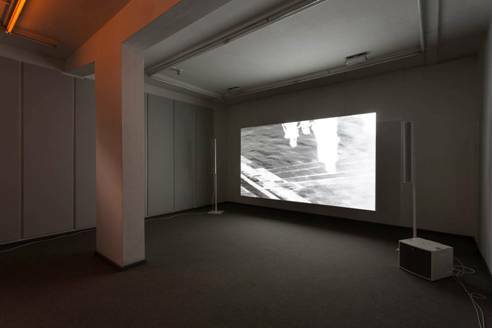 Richards typically combines footage that he has shot himself with found footage and soundtracks of his own making; in this respect the new work is no different. The artist uses a digital camera almost like a diary, taking down ‘notes’ of anything that takes his attention in the course of daily life, and weaving these fragments together. In Raking Light all the different elements are unified by what appears to be a solarising, or negative treatment of the film, so that black becomes white and light dark. Spindly, silhouetted trees shiver diminutive leaves in an almost anthropomorphic way (‘willows whiten aspens quiver, little breezes dusk and shiver’*), water rushes over rocks, so that the spray appears to rise like black smoke; repeating motifs, such as a glass of water effervescing, find visual rhymes with a sky full of black starlings whirling in a great mass. Brief shots of forest scenes are illuminated by what must be fireworks falling out of the sky and hitting the great trunks in showers of sparks – but my mind conjured ideas of prehistoric meteor storms. 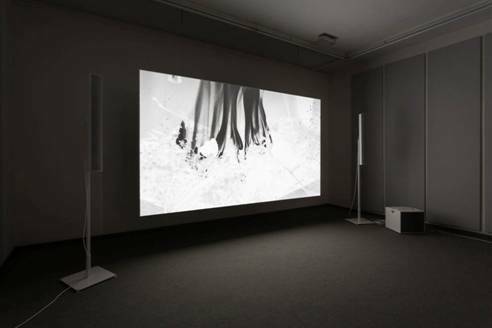 In negative, a shot of a small fire renders the black flames velvety and this extreme emphasis on texture and the natural world is perhaps at odds with the prevailing rhetoric about the enabling digital technology. Here, instead of flattening difference, or rendering hyper-smooth animated forms, Richards is exploring the natural world in all its grainy, fast moving, randomising detail. Water sends off over exposed flares of light as the sun hits it, or bubbles to a rumbling, ominous soundtrack in a view from just under the surface. Interwoven among these elements are shots of a boatload of tourists in yellow oilskins that match the colour of a bilious sky. Standing aboard the Maid o’the Mist to tour the spray fields of the Victoria Falls they are at the same time endearing and almost comically innocent. Finally we switch away from the roaring tons of water to a more abstracted sequence: a close up of a shiny blade turns this way and that until we can focus in on the ghostly face reflected in it. Is this the artist? The negative treatment of the film turns the face into something resembling a skull, so it is impossible to know. A memento mori, perhaps, in the classical tradition. If you’re looking for a ‘palate-cleanser’ after the excesses of the week: this is it. Wonderful.